Welcome to the Chocolope Cannabis Strain! Imagine a warm spring morning bursting with sunshine and fizzing with energy. Now add to this picture the combination of a rich strong coffee, chilled slivers of dark chocolate, and freshly sliced fruit drizzled with vanilla. All this and more awaits you in Chocolope, a stunning and vibrant bud that’s bursting with flavor. An energetic high and mouthwatering smoke makes this Sativa the perfect accompaniment to your morning ritual. Developed as a cross between Chocolate Thai and Cannalope Haze – two respected Sativa strains which are well regarded for the uplifting highs they provide – these premium genetics combine in a plant which results in a more consistent yield. Alongside the production benefits, Chocolope mixes earthy and sweet flavors into a smoke that must be tasted to be believed. This Sativa dominant strain clocks in at 95% Sativa and just 5% indica genetics. With a respectable THC content ranging from 18 to 23%. For those who have relied on the traditionally indica heavy strains grown indoors for their previous consumption, this almost pure Sativa will produce a high unlike anything you’ve experienced before, and for those who are familiar with the expansively buzzed high that only sativa’s can produce, this strain will be worth the wait. As indicated above, most of the commercially produced weed over the last quarter century has been dominated by indica heavy strains. Due to most cannabis production having been concentrated indoors, the stockier and more compact characteristics of this half of the cannabis family has been prized. Unfortunately this has given rise to the myth that sativa dominant strains are ineligible for indoor grows and are more difficult and lower producing specimens. This need not be the case at all, and if you’ve not attempted a Sativa before then Chocolope can provide the perfect introduction to the more mysterious and rare side of the cannabis family. If you are going to grow outdoors, then the only consideration really to take into account with a sativa strain is heat and seasonal length. 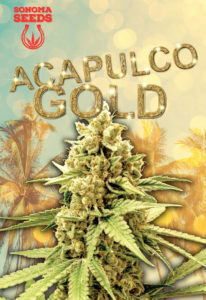 Since Chocolope’s genetics hale from Thailand and South-America, it will come as no surprise that it requires a fairly lengthy growing season – generally 10 weeks in flowering alone – and does not tolerate colder climates. If these conditions are not generally available to you, and moving seems a bit extravagant simply to facilitate a grow, then your best bet is to provide these conditions artificially, i.e. bring it indoors. Like most sativa strains, Chocolope will prefer a generally hot and relatively dry climate, a minimum of 72 F or 22 C should be provided to keep the plants comfortable and producing the greatest number of flowers. Also, humidity must be kept in check to avoid mold and other plant problems. Since sativa’s are such prolific growers they can easily fill your grow space and so careful management of their height must be performed throughout the growing season. There are generally three ways of managing the unruly energetic growth of sativa’s in confined spaces. Two of these methods involve blades and the third requires restraints. And lest all this talk of confined spaces, sharp objects, and ties give one the wrong ideas, we are simply speaking of manicuring methods. Top cropping involves cutting the main stem of the plant in order to encourage the main stem to split; this has the dual advantage of providing double the potential bud sites, and limiting the plants height, ensuring that all of the bud-sites are within a reasonable distance of the light source. The second approach to trimming involves performing a similar trim on secondary branching sites to again try and coax the plant into a bushier configuration; thus working to reign in the sativa’s naturally tall growth pattern. The third way of managing its growth is to tie the main stem down, either by placing a netting between the plant and the light so that the stem can be tied horizontally and trained to produce a horizontal canopy, or by bending and then staking down the main stalk, again to encourage horizontal rather than vertical growth. This might all seem a little much when there are strains available that require none of this extra attention, but the flavors, aromas, and pure uplifting high that can be achieved with Chocolope make this extra work well worth the effort. The powerful creative high that is produced from sativa’s must be experienced to be understood. It’ll get you up and out of your seat, and once you’ve had success with this strain it will no doubt gain a permanent rotation in your garden. While the high is energetic and positive, cotton-mouth seems to be common with this strain, and thus food or drink pairings can be particularly helpful. Given Chocolope’s flavor profile, it would pair well with sliced fruits, such as pineapple or grapes. Chocolope is an excellent entry into the wonderful world of sativa’s, and with a little extra care and attention will lift your growing skills as well as your day.